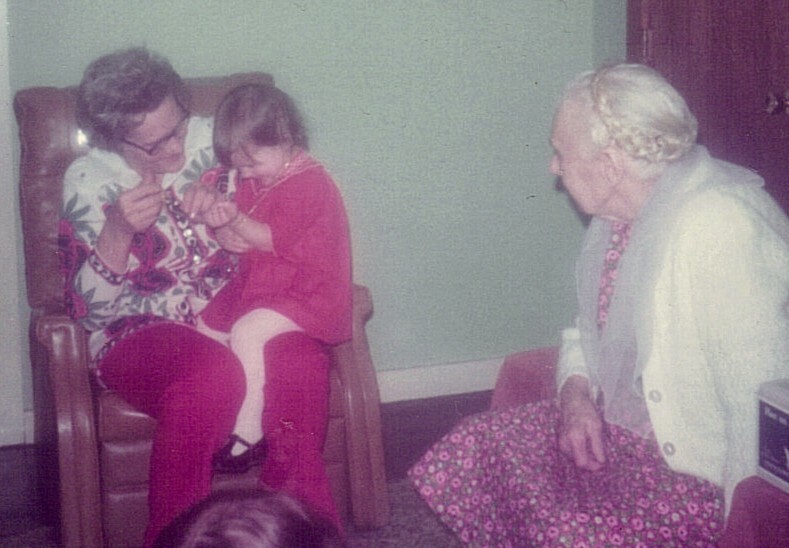 Growing up with some of my favorite old folks–my grandmother and great-grandmother! At my church here in the mountains of NC we call homecoming, “Old Folks Day.” I LOVE this. Although there has been some push back in recent years from some of the folks who felt like they were beginning to fall into the “old” category. I see the name as referring to all those people–living and dead–who have brought us to the place we are today. And I really, really like those people. I guess my daddy raised me to have respect and admiration for the “old folks.” I went to a church where most of the congregation was edging on toward senior and although we few kids had our own Sunday School class, we interacted with everyone. And we visited the old folks regularly–my great-aunt and uncle, grandparents, neighbors–they were just people who happened to have been around longer than me. Sometimes a LOT longer. Some of my dearest friends have been or are old folks. Yesterday I went to visit Anne (93). We had a lovely chat about books and farm life and what we like to eat. She was a librarian from Kentucky who spent a year working in New York City–what stories! The day before that, we attended our friend Bill’s (94) funeral. I knew many of his stories, but got to hear for the first time a line from a letter he wrote shortly after he met the woman he would be married to for 64 years. “She has a barrel full of good sense,” he wrote. Indeed she did. I think the people of Appalachia tend to have a deep respect for their elders. Maybe it’s because they know how to do things the modern world has forgotten. Like cut hay with a scythe. Or make a spring tonic. Or sit on the front porch and watch the night fall as the whippoorwills call. Whatever the reason, I’m glad to have “old folks” in my life–even though it means losing them all too often. And I very much hope to earn that name for myself one of these days. I promise not to protest. thanks Sarah…. I too have enjoyed stories from my elders…. and now I are one!………but I have computer skills and can write them down….. I hope my readers are as respectful and loving as you are….. Blessings…. I’m so glad you’re writing them down! Priceless treasures . . .